There are plenty of parts of our story that I can’t tell. People are too narrow-minded to accept such a lust for life. We don’t belong to the same species. We never wanted their lives, and I can see in their eyes that our defiance sends them scurrying back to their doghouses the second a particularly Cardinal episode comes up. Over the years, I have figured out which things are most remarkable, and I don’t pour it on any thicker. I stick close to what’s deemed acceptable. I was five, maybe six, and the town seemed to go on forever. Yet I simply had to stand on the sheet metal roof of the dynamite shed, which we would slide down winter and summer, and I could see the entire expanse of it. From the disused fire station that gleamed white in the sun (it was built just before the mine closed) to the flimsy hovels scattered along the forest’s edge, there were three large, square, grassy plots of land and, lost in the desolation, a few houses in ruins or well on their way. It was the same when you looked along the other axis: space, tall grass, grey asphalt roads full of potholes, a few forsaken buildings and, just about anywhere you looked, the mounds left by houses that had been transported elsewhere: the cement foundations, the sagging sheds, the body of a car that didn’t want to follow. And sometimes, lo and behold, a smart, tidy house cultivating flowers and hubris. Like the Potvins’, which had once been the city hall. Just two children. The son was going to college, the daughter to convent, and their mother played the organ at church. Rich people we cheerfully despised. The novel actually takes place years later, though, once the “golden age” of the Cardinal children has passed, and their clan has grown up and all but dissolved. For the first time in years, the entire adult family is reunited, forcing them to come to terms with an event that has haunted them all for decades: their involvement with (and as we learn more, perhaps responsibility for) the mysterious disappearance of one of their own. Each chapter is told from the perspective of a different sibling, consisting of introspective, intimate monologues and memories from several members of the family. The novel owes much of its suspense, mystery, and thought-provoking ambiguity to this multi-perspectival form. 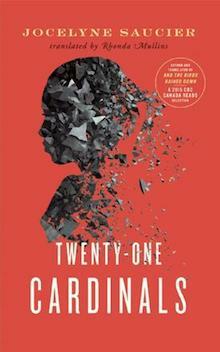 The fragments of the Cardinal family’s unusual past are pieced together through these accumulating shards of memory and knowledge: their story cannot be fully told by any one member, and the troubled past that poisons the family can only be resolved through bringing together the combination of secrets, big and small, that all of them keep. It is immensely satisfying how Saucier strategically unfurls the details of the Cardinal saga through the lenses of the different “generations” of its children; from the oldest child, Émilien with perhaps the most perspective, having had the full view of the family history, to the youngest, The Caboose, who, in his worshiping naïveté relishes the romanticized stories of the Cardinal children’s peak years. It is fascinating to see how the Cardinal children’s lives have diverged, and how they have each dealt with the aftermath of their former life together—they are scattered around the world, all living in drastically different ways. Each glimpse into these lives yields a depth and investment in the characters that is remarkable for the brief chapters they inhabit; I often found myself wishing that I could dive even deeper, linger a little longer, in each of their divergent worlds.